EXIF still missing - or did I just not find it? Under the icon of "Edit photo details" I would very much like to be able to look at the EXIF-data, like we could befor the change here. Is there a place now, that I have not found yet....? Looking at EXIF-data is a big help for myself. Especially old pictures that I have uploadet years ago, and cannot find again in my own archives - with the EXIF-data on your page I can go back and check the Exposure-date! Thats it, that is exactly what I was missing from the old style. Thank you very much, Jorge - I am happy as a lark now! oh. Ok. I got it. All fixed. 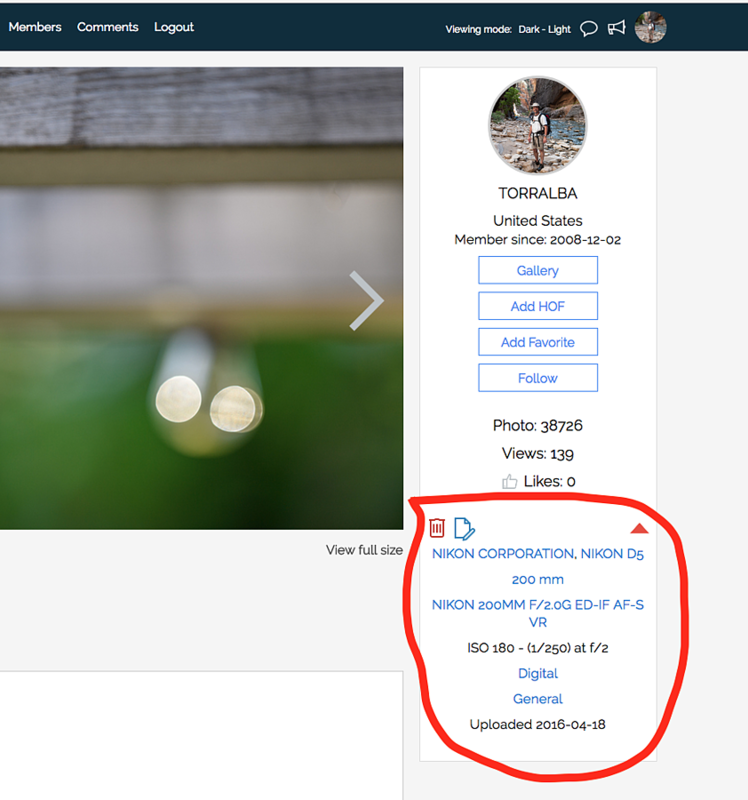 Expand the photo details like in the example above with the red circle, then click on "Uber Exif"
NO, Jorge!! - You missunderstand what I am trying to tell you. I have not upgraded fujifilmimages yet to the new software. But that is not what I ment, as this is only basic information and shows the bare necessities only. On the old site there was better and extendet EXIF-information available. For instance - if I were to look up one of my older (5 - 10 years old) image here on nikonimages.com - I could check the EXIF-data and find out WHEN it was taken, and thus find the image in my own (and 6-Terrabytes!) archives. B.T.W. : I was just now trying to upload an image here in my answer and did not succeed.